A symphony of colors and florals make this arrangement burst into song. It is visually stunning and the perfect choice to add an uplifting element for any occasion! Florals are designed in a leaf-wrapped cylinder vase. This beautiful bouquet is a sophisticated mix of roses, green hydrangea, carnations, button mums and alstromeria. Gorgeous for any occasion, from tea parties to romantic evenings . 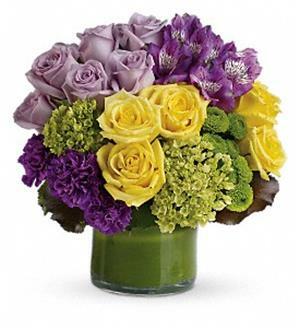 This chic arrangement includes miniature green hydrangea, lavender and yellow roses, purple alstroemeria, dark purple carnations, green button spray chrysanthemums, galax leaves and a ti leaf. Delivered in a clear glass vase. Approximately 12 W x 12 1/2 H Flowers and container used subject to availability and season. Some substitutes may be necessary.